Dietitians and other healthcare providers appreciate the variety of information covered in this high-impact tool for nutrition education. 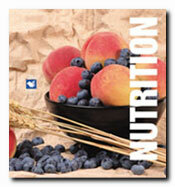 Includes stories on the food pyramid; reading product labels; and healthy ways to cook with grains, eggs, beef and beans. Carbohydrates: How Much Is Enough? Fat: How Much Is Enough? Calcium: How Much Is Enough? Should You Feed Your Kids Cartoon Foods?